Creations for Charity – More Creations Available! Creations for Charity 2018 is well underway, with over $5,000 raised in the first week to buy LEGO sets for underprivileged children this Christmas! The organisers have now released another tranche of awesome creations to the Creations for Charity online store, including a few vehicles. One of these appears to be Crash Bandicoot from Crash Team Racing, which we’d rather like for ourselves! If you’d like to help this fantastic cause you can check out the creations available to buy by clicking here and you can read full details of the fundraiser via our previous post by clicking here. Creations for Charity 2018 has arrived! Creations for Charity, the amazing annual fundraiser that provides thousands of LEGO toys to underprivileged children is back for another year! Many of the world’s best builders will be donating creations to the Creations for Charity online store, raising money to purchase LEGO toys for children in need around the world. You can join this incredible initiative in a number of ways; by publicising Creations for Charity, donating your own creation, or by buying one of the unique creations for sale via the online store. Donate a Creation: Donations are now open – if you’d like to give away a creation that you think could raise money to buy LEGO toys for children who may otherwise receive nothing this Christmas then please click here to get in touch with the Creations for Charity team! Buy a Creation: Click here to see the brilliant creations already donated to the Bricklink store, where each model is for sale with all proceeds used to buy LEGO sets for children in need. It’s that time of year again, when millions of soulless zombies descend on shopping malls around the world, or frantically click ‘buy’ from the comfort of their office chair, in an attempt to obtain something they hadn’t thought about owning until today. As is traditional The Lego Car Blog won’t be taking part, and if you’d like to avoid the annual greed apocalypse too there are some great alternatives! The wonderful Creations for Charity 2017 is in full swing, where you can buy unique fan-built Lego creations from which the proceeds are used to provide LEGO toys to underprivileged children. Visit the Creations for Charity store by clicking here and do something amazing this Black Friday! We can also recommend Oxfam, Christian Aid, The Red Cross, Unicef and Tearfund, and finally just by being here you’re doing some good too, as the revenue raised by the adverts on this site is donated to causes worthier than ourselves (which isn’t hard! ), so if an advert interests you please click it, your visits really do make a difference! Creations for Charity 2017 is here! Creations for Charity, the awesome annual fundraiser that provides thousands of LEGO toys to children in need, is now open for 2017! Many of the world’s best builders will be donating creations to the Creations for Charity online store, raising money to purchase LEGO toys for underprivileged children. You can join this amazing initiative in a number of ways; by publicising Creations for Charity, donating your own creation, or by buying one of the unique creations available via the online store. Donations are now open – if you’d like to give away a creation that you think could raise money for children who have nothing then get in contact with the Creations for Charity team, they’d love to hear from you! If you’d like to see some of the amazing creations already donated head over to the Creations for Charity website to take a look, and if you like what you see remember that each of them is available to buy, so you can take any one of the models home! Black Friday is upon us once again, that unique time of year when people are willing to trample their fellow man to death to secure a discount on an electrical appliance. We hate Black Friday. As has become traditional, unlike the proper Lego blogs we’re not taking part in the annual greed apocalypse, and instead we’re offering some alternatives to help you to avoid becoming just another mindless, soulless zombie with an unquenchable thirst for acquiring ever more pointless landfill. The awesome Creations for Charity campaign is back for another year, with some incredible fan-built models available to buy and where all proceeds are used to provide LEGO sets for underprivileged children. There’s just one week to go – to see what’s available and make a real difference to a child this Christmas visit the Creations for Charity 2016 page here. Finally of course, just by being here you’re doing a little bit of good. All profits generated from the advertising you see here at The Lego Car Blog are donated to those who need them more than we do, including the charities above and also at a more local level around TLCB Towers. A huge thank you for your clicks – they mean the world to us. Black Friday, that unique time of year when people are willing to stab one another over a discounted television, is upon the world again today. As TLCB will not be taking part we’d like to offer you some neat alternatives to help you avoid getting into a fight over something you didn’t even know you wanted at Walmart. Creations for Charity; A brilliant annual event giving you the opportunity to buy unique creations built by some of the world’s best builders, with all funds raised used to buy LEGO toys for underprivileged children. If you’re going to buy something today, buy it from the Creations for Charity 2015 store. You’re also doing something good just by visiting this website. We don’t allow many advertisements to appear here at TLCB, but the revenue generated by those that do is not used here. Blogging is a privilege – we love sharing the web’s best Lego vehicles and helping to bring recognition to the builders behind them – so we don’t need to keep the revenue that this site earns. Instead this is used for a variety of good causes, from simply buying meals for those who are homeless around TLCB Towers to assisting in international disaster relief. From all of us at TLCB, thank you. 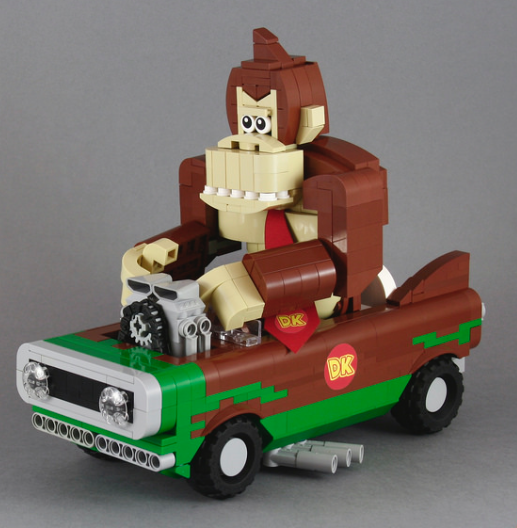 The brilliant Creations for Charity 2015 is well underway, and this equally brilliant Donkey Kong racer by Flickr’s 6kyubi6 is now available to buy! All of the money raised is used to purchase LEGO toys for underprivileged children this Christmas – get involved and do something amazing; click here! Creations For Charity 2015 donations are now open! The awesome people over at Creations for Charity raise thousands of dollars each year to provide LEGO sets to underprivileged children at Christmas, through the auctioning of incredible one-off Lego creations. But first they need creations to auction. If you’re a talented Lego-builder and if you think you have a creation, or could make a creation, that people would love to buy, then get in touch with the Creations for Charity Team and be a hero this Christmas. You might also restore some balance to a LEGO-selling culture that is for the most part, full of blatant douchbaggery (see above, and that price isn’t even in Dollars…). You can donate your own creation, and see some of the models already donated, by clicking this link to Creations for Charity 2015. Let’s help them raise more than those douchebags want for that Millennium Falcon! Creations for Charity 2015 is here! 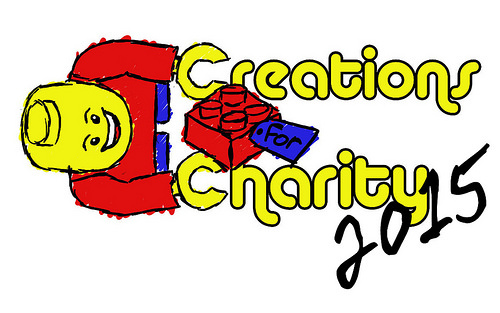 Creations for Charity, the incredible annual fundraiser that provides thousands of LEGO toys to children in need, is now open for 2015! Some of the world’s best builders will be donating creations which will be placed for sale in the Creations for Charity online store. All of the money raised is then used to purchase Lego toys for children who would otherwise receive nothing this Christmas, and that is just awesome. You can join this amazing initiative in a number of ways; by publicising Creations for Charity, donating a creation, or bidding on one of the awesome creations available in the auction. Donations open today – if you’d like to give away one of your creations that you think could raise money for children who have nothing then get in contact with the Creations for Charity team, they’d love to hear from you! The Creations for Charity 2015 store opens on October the 15th, so check in regularly to see what’s available and get ready to bid! Every year Creations for Charity invite you to help raise money to provide LEGO toys for children in need around the world. This wonderful annual event gives you the chance to buy custom LEGO MOCs from some of the most talented builders in the LEGO Community. You’ll become the owner of a unique and brilliant creation, and all proceeds are used to bring happiness and joy, in the form of our favourite toy, to children who otherwise would not get anything to play with this Christmas. LEGO is the perfect toy for such children as it can be played with for years without breaking, without needing batteries, and without age limits or gender associations. 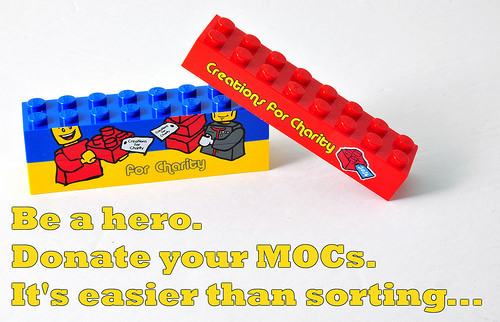 You can participate in two ways; by bidding for a unique MOC, or by donating a MOC to Creations for Charity yourself. The Lego Car Blog wish Creations for Charity every success with this year’s fundraiser.